Microgrids are becoming a growing force in the energy sector. Sales for this emerging technology are estimated to surpass $3 billion within the next few years. Microgrids are local electric grids that can be controlled to connect or disconnect from the traditional electric grid. Usually a microgrid is powered by the main grid, however, in the case of a power outage it is able to function individually. The flexibility of this technology provides many benefits including reliability and efficiency for users. Microgrids can be used as a backup in the event of power outage emergencies, as well as provide energy for small locations and cut down costs. These systems maintain a significant role during the case of an outage in buildings such as hospitals, military bases, and universities. This new technology can also be combined with renewable resources to create power and reduce the amount of pollutants and greenhouse gases. In addition, the application of microgrids decreases the stress load on the main electric grid system during peak periods. With new developments in microgid technology, the application of these systems will only keep increasing around the world. Federal and state R&D credits are available for companies involved in microgrid development and innovation efforts. There are several rising power sources for microgrids including generators, batteries, and renewable resources. Many microgrid systems utilize solar, wind, geothermal and combined heat and power (CHP) systems. Renewable energy sources such as solar and wind do not produce the same amount of energy each day so consistent control over these systems and continuous forecasting are needed in order for the system to run smoothly. 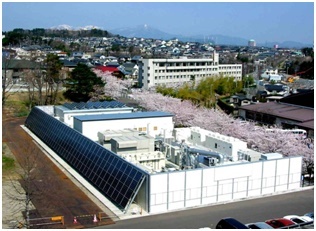 Electricity generation and storage when main grids are not functioning are significant features offered by microgrids. Frequent power outages over the past few years have resulted in increased microgrid applications. Back up grid systems for critical facilities, such as military bases, are particularly important. An Inside Energy study revealed that the average amount of outages over a five year period has doubled every five years. From 2000-2004 there were about 44 outages each year which has jumped to a steep increase of 200 power outages per year during 2010-2013. Several of these incidents have occurred from weather associated events such as hurricanes and snowstorms. Certain states have created incentives for companies developing microgrids due to the increasing amount of power outages. Several states, including Connecticut, Massachusetts, New York, New Jersey, Maryland, and California have already created microgrid incentive programs. Connecticut is presently up to their third round of funding since 2012 and is offering up to $30 million for microgrid developers. California has developed an energy storage program which encourages the use of microgrids. In 2014, the state offered $26.5 million in grants for integrated microgrid and renewable resource systems. The California Energy Commission also issued a program for projects that included low-carbon systems for vital buildings and high penetration renewable energy systems. Those who want a higher chance of qualifying for funding should adhere to the standards for each project. The creation of these and other state incentives encourages companies to develop microgrid systems. ALSTOM Grid, Inc. who will use the funding for researching and designing community microgrid systems in Philadelphia, PA.
Burr Energy, LLC is designing and building a system for the Maryland Town Center to utilize in the case of an outage. Commonwealth Edison Company (ComEd) of Illinois is developing and testing a microgrid controller, which manages two or more interconnected systems. The Electric Power Research Institute (EPRI) is creating a standardized microgrid controller. This device will allow for continuous power during critical loads. General Electric Company (GE) is developing a microgrid control system with new factors which will help support critical loads in Potsdam, NY. TDX Power, Inc is engineering, designing, simulating and building a microgrid control system on Saint Paul Island, Alaska. The microgrid will include different energy resources, which will lead to a cleaner environment. The University of California, Irvine (UCI) has created a program called the Advanced Power and Energy Program for developing and testing a generic microgrid controller to be used for managing a variety of microgrid structures. New York University was initially powered by an oil fired cogeneration plant, however chose to transfer to a natural gas fired CHP facility. The system cost was $126 million and was lowered due to tax exempt bonds. The microgrid is made up of two 5.5 MW gas turbines to produce electricity combined with heat recovery steam generators and a 2.4 MW steam turbine. The equipment is normally attached to ConEdison’s main grid, but can function individually as well. During Hurricane Sandy, the structure proved capable of standing on its own. Since switching to this new system, the university has received economic and environmental benefits. The college saves around $5-8 million per year on energy costs, has achieved a 68% decrease of pollutants, and seen a drop of 23% in greenhouse gas emissions. Clarkson University has recently received almost $1 million in fundign from the National Science Foundation to develop a microgrid. This large investment was given to the college in order to improve disaster response activity. The funding will assist with the development of a smart scheduler application, which will be targeted at prioritizing the system’s performance during emergencies. Clarkson University’s School of Engineering, Business, Arts, and Sciences are involved with the project, along with National Grid USA and the Electric Power Research Institute (EPRI). National Grid will own the underground distribution network and EPRI will work on the project design, data collection, and analysis. San Diego Gas and Electric Company (SDG&E) has installed a microgrid system in Borrego Springs, CA. For this development, distribution assets are owned by the utility and the energy resources are owned by the customers. Companies in support of the project include Lockheed Martin, IBM, Advanced Energy Storage, Horizon Energy, Oracle, Motorola, Pacific Northwest National Laboratories, and the University of San Diego. Project funding included $7.5 million from the DOE, $4.1 million from SDG&E, $2.8 million from CEC, and $0.8 million from other partners. The microgrid features about 4 MW of capacity, consisting of two main 1.8 diesel generators, a 500 kW/1500 kWh battery, three 50kWh batteries, six 4kWh/8kWh home energy storage units, 700 kW of solar PV , and 125 residential network systems.xi SDG&E will conduct a cost benefit analysis of the project to determine the economic, reliability, environmental, security, and safety benefits. The Borrego Springs project is the largest utility-scale microgrid in the U.S providing up to 26 MW of power. The solar powered microgrid system was tested in a community over 8 hours and residents only lost electricity when the power was switched between the grid and the microgrid. Due to this problem, SDG&E are trying to develop control devices, which would be able to control the system and maintain power when the source is switched between grids. During lower energy usages, especially during the winter, this system alone would be able to support residents with up to 48 hours of electricity. With the successful results of this project, SDG&E is working on several microgrid systems to service other locations. Homer Energy was created by the National Renewable Energy Lab (NREL), a subsection of the DOE. Homer Energy’s Hybrid Optimization of Multiple Energy Resources (HOMER) model is a software platform designed to assist users in creating the most beneficial and efficient system. The HOMER platform allows users to analyze the feasibility of using various technologies by evaluating the cost, electrical load, and energy resource availability. The HOMER software is beneficial for companies who want to invest in new microgrid technology and are unsure where to begin. Siemens Corporation has been a leading company in the innovation of new microgrid technology. The company is highly confident that the amount of microgrids in use will increase over the next few years. Due to this, Siemens has developed software, which allows users to easily maintain and run their distribution system. The Spectrum Power Microgrid Management System (MGMS) control system provides owners with reliability, efficiency, security and sustainability. The MGMS can determine which times are the best to purchase power from the main grid system and how the system can be most efficient. Owners can also choose to generate their own energy. The MGMS gathers information pertaining to power generation and storage, energy consumption and energy exchange with the main grid. This data allows users to further analyze by utilizing supervisory control and data acquisition (SCADA), forecasting and real time optimization features. Schneider Electric, Oncor, and S&C Electric Company have partnered to create a four part microgrid. S&C and Schneider Electric built the structure over a 6 month period, which was designed to combine energy storage and renewable resources with modern software to create an efficient system. The structure consists of four microgrids powered by two solar PV groups, a microturbine, two energy storage units, and four generators. Two batteries for energy storage are provided by S&C and Tesla Motors. The system is able to function at a peak load of 900 kW for two hours. The supplied energy during nighttime hours then decreases to 550 kW. A microgrid split into four sections allows each part to be individually controlled as separate units or as one whole unit. A four part design also makes it more reliable in the case of a power emergency. Rural areas in East Africa are experiencing a new wave of technology with the utilization of microgrids. In remote areas, public entities are usually in charge of distributing energy. Powerhive Inc., based in California, has created a system to generate and sell electricity to the public. The pay-as-you-go energy service allows customers pay a base fee and choose from different service levels offerings. Powerhive uses a unique mobile payment system provided by M-Pesa and takes advantage of other technologies to provide the most efficient services. Powerhive’s Site Wizard software for Analysis, Reconnaissance, and Mapping (SWARM) was developed to analyze optimal locations for microgrid placements in order to produce the most power. Once a location is chosen, a smart meter is built for tracking the system. The Asali smart meter device connects to Honeycomb, a cloud platform, which is used to manage and monitor the system’s activities. Such activities include equipment performance, energy consumption, price information, load balance, and optimal sites during a failure. The network sensors track how much energy is generated and how much is being consumed by each customer.xv The system can also control energy distribution by using the network sensor data. Powerhive has created innovative and interconnected solutions to provide energy for a wide range of customers. On a global scale, many companies are noticing the benefits of incorporating microgrids into the traditional grid. The growth of renewable energy and energy storage in combination with microgrids has created more reliable and affordable microgrid systems. Federal and state R&D Tax Credits are available to companies developing and integrating these innovative microgrid systems.